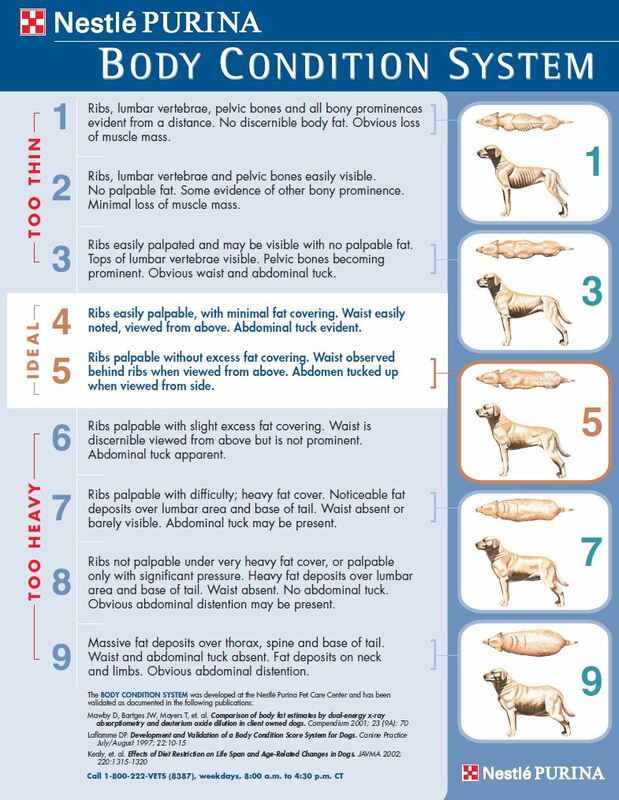 Dr. Vickers recommends this Nestlé Purina Body Chart to assess your pet’s BMI, which uses a 1 to 9 scale. Your pet should be a 4 or 5 on this scale (click on the picture to enlarge). 1. You should be able to feel the ribs easily behind the elbows. 2. When viewing the pet from above, there should be a smaller waist behind the ribs. When viewing from the side, there should be a tuck behind the ribs. 3. 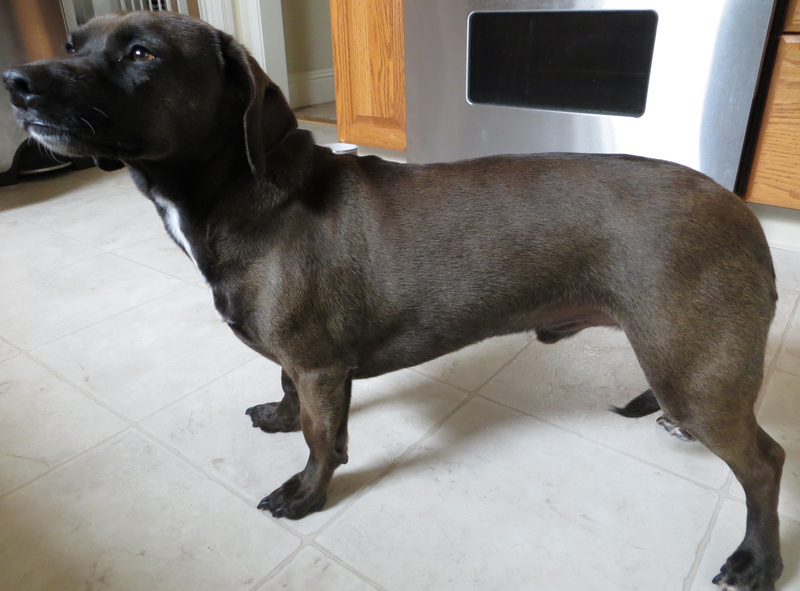 The ribs and spine should not feel bony, which means your pet is too thin. The best bet is to see your veterinarian and have them assess your pet’s weight. Your doctor can also provide you with a weight-loss plan if your pet is overweight, including feeding and exercise requirements. Much like their overweight human counterparts, pets are simply taking in too many calories. From dense pet food to table scraps to treats, our pets are taking much more than they actually need. Make sure you know your pet’s weight and pay attention to the suggested serving sizes on kibble bags and canned foods. Use measuring cups to dish out food; don’t just eyeball it. But there isn’t a one-size-fits-all serving-size suggestion. But if your pet falls into the overweight or obese category, you’ll need to cut back those added calories. 1. Decrease total calories by 20 percent and weigh every 1 to 2 weeks. 2. Decrease calories even more if they continue to gain weight or hit a plateau. 3. Once ideal body condition is achieved, raise the amout of food to maintain weight, once again guided by weigh-ins. Another common feeding mistake is leaving a food bowl out at all times, including automatic food-dispensing bowls. It’s better to regulate your pet’s meals and to break up his daily allotment of food into several smaller servings. Dr. Vickers says this is especially true for cats, who are made to hunt and eat ten times a day. 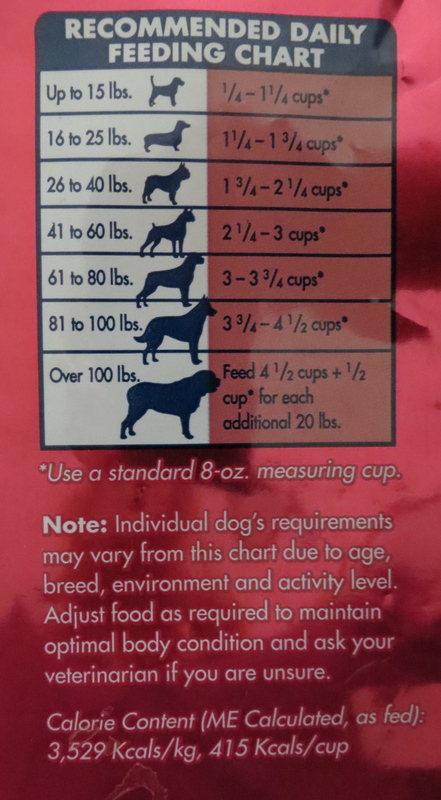 Here’s an example of how to break down the food: Yellow Dog eats one cup of food on a normal day, so we split it into two half-cup servings, one in the morning and one in the evening. If he gets a really long walk or is especially active at the park, he’ll get an extra half cup of food for the day after his exercise. Yellow is also a treat hound, so we make sure to reduce his kibble intake when he gets lots of treats. Don’t forget to factor those cookies and other treats into your pet’s overall caloric intake for the day! The flip-side of the obesity coin is exercise. Pets are simply not moving enough to burn off all those excess calories. “A lot of people underestimate the amount of exercise a pet needs, or do not have the time, ability or motivation to provide it,” Dr. Vickers says. So exactly how much exercise does your dog need? It depends on the type of dog you have. The APOP study also found a correlation between obesity in animals and in children. The doctors found both to be inactive and eating poorly. They suggest encouraging the kids to walk the dog to get both up and moving. If you have a hectic schedule, try to squeeze in a 15 to 20 minute walk before and after work. Your dog will be calmer when you leave for work and healthier to boot! Many store-bought treats are loaded with unhealthy fat and additives. It can be a task figuring out exactly what’s in some of the commercial foods on the market. If you’re looking for healthy and safe treats, there are a few human options worth trying. Veggies like green beans, peas and carrots fill pets up without adding too many calories. Make sure if you use the canned variety you buy the veggies in water, with no added salt, garlic or onion. Chicken without the skin, drained cooked low-fat beef, and turkey are also good additions, but keep the portions small and factor them into the overall calorie intake for the day. Yellow Dog also likes tomatoes, so we give him a cherry tomato every now and then. Now you’re armed with the tools to get your dog or cat back into shape. Obesity and the diseases that come with it are highly preventable. Battling the bulge now will help your pet live a longer, healthier and happier life. Note the advice in this article is not a substitute for seeing your veterinarian and getting an assessment for your pet. Your vet will provide you with the best diet and exercise instructions for your individual pet and monitor his weight. This entry was posted in Health and tagged Association for Pet Obesity Prevention, cat, Dog, dog food, exercise, healthy weight, obesity, overweight, pets, treats by jaqbennett. Bookmark the permalink.